Whether you’re working in a commercial building or a home office, hardwood flooring has many advantages over the other flooring choices. Whether you’re working in a commercial building or a home office, hardwood flooring has many advantages over the other flooring choices. The warm aesthetics, durability, and easy upkeep of hardwood flooring make it a clear choice for your office space. 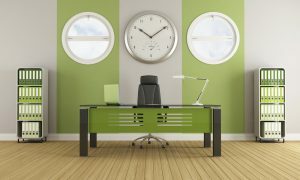 Here are some more reasons to choose hardwood for your office. When your clients come into your office, they expect a certain amount of professionalism, even from your design choices. Whether you want a warm, homey feel or a more modern look, there is a hardwood flooring choice out there that is perfect for you! Hardwood flooring is exceptionally durable. If your office sees a lot of traffic, hardwood flooring is the perfect business investment because it stands the test of time. As an added bonus, solid hardwood flooring can be refinished so you won’t have to worry about the costs of replacing vinyl, carpeting, or other flooring choices. If you’re in a home office, hardwood flooring will increase the value of your home. In a commercial setting, hardwood floors will fetch a higher price for renting or re-selling. Most office spaces with hardwood floors also sell or rent faster than units with other flooring choices as well. You do everything that you can to ensure your employees are as comfortable as possible so that they can do their jobs well. Improving air quality will go a long way toward ensuring this. Dust, dirt, and other allergens can get trapped in carpeting. If there are people with allergies in your office, this could make them very uncomfortable. This entry was posted on Friday, January 5th, 2018 at 4:36 pm. Both comments and pings are currently closed.